Jan L. M. Leunissen, Ph.D.
Ultra small gold (ø <1.0 nm) conjugates provide a marker system that has greater labeling sensitivity and better penetration than larger gold particle conjugates, and higher spatial resolution than enzyme conjugates. These advantages, along with the availability of silver enhancement reagents, have made it possible to apply pre-embedding immunogold/ silver techniques to the localization of intracellular antigens. Initial results obtained from cultured neurons using Aurion ultra small conjugates have been described in Aurion Newsletter Nr. 2 by van Lookeren Campagne. However, further refinement of Aurion Ultra Small Gold reagents and the introduction of Aurion R-Gent SE-EM electron microscopy grade silver enhancement reagents have greatly broadened the application of the pre-embedding immunogold/silver technique. The present issue of the Aurion newsletter describes the state-of-the-art. The pre-embedding immunogold/silver labeling technique has proven to be a powerful tool for the in situ study of macromolecules. In the field of neuroscience, for instance, before the invention of ultra small gold in the late 1980’s, most ultrastuctural localization studies in brain tissue were confined to identifying the nature of labeled neuronal elements. Today, in contrast, a receptor protein can be precisely pin-pointed to its functional site on the neuronal membrane. However, questions such as antigen accessibility, antibody penetration, and particle size and shape regularity have persisted since the introduction of this technique. We present here a few cases of our immunogold localization studies that may help address such questions to a certain level. The proteins in these studies are dopamine transporter, MGP-130, MGP-160, parvalbumin, and a huntingtin-related protein. Dopamine transporter (DAT) is a protein in the CNS responsible for dopamine removal from the extracellular space after synaptic transmission. In the striatum, DAT is localized in dopaminergic axon terminals. When the immunoperoxidase method was used to detect a site-specific monoclonal antibody against the putative N-terminus of this transporter, axon terminals were entirely filled with enzyme reaction product (Figure 1). However, when the primary antibody was labeled with ultra small gold conjugates and enhanced with R-Gent SE-EM, the gold particles were found on the cytoplasmic side of terminal membranes (Figure 2a,b), in agreement with the predicted location of N-terminus of the protein from biochemical evidence. When 50 µm vibratome sections were labeled with dopamine transporter by pre-embedding immunogold method, and thin sectioned perpendicularly to the surface of the vibratome section, labeled axon terminals could be found as deep as 8 µm from the surface (Figure 3). In another case when parvalbumin in the CNS was labeled with the same method, labeled dendrites could be seen up to 12 µm from the surface of the vibratome sections. A frequently asked question regarding pre-embedding immunogold labeling is if no gold/silver particles are found inside membrane bound organelles, how can one know if it is because the antigen is not present, or because the antigen is not accessible to the immunogold reagents? Indeed, while it is hard to conclude the absence of antigen based on negative results, many studies have successfully demonstrated labeling of antigens in “hard to reach” sites. Figure 4 demonstrates the labeling of two golgi proteins. In 4b, a huntingtin-related protein is localized on the outer surface of the golgi membrane, and in 4a the golgi marker protein MGP-160 is localized within the lumen. 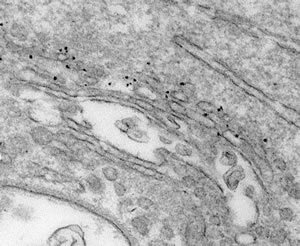 Note the integrity of the golgi membrane ultrastructure. 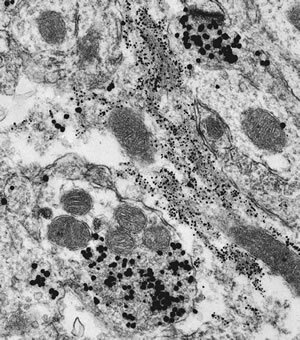 Antigen accessibility is influenced by the complexity of the tissue, the type and extent of fixation, the type and extent of detergent treatment, and the physical characteristics of the immunoreagents. The labeling of MGP-160 in Figure 4a was achieved using a perfusion fixation with 3% formaldehyde, 0.15% glutaraldehyde, a permeabilization with 0.05% Triton- X-100 and using F(ab ’)2 or F(ab ’) antibody-gold conjugates. Details are described on page 6. The final size of gold/silver particles is the result of silver enhancement duration (when the temperature is constant). One of the characteristics of R-Gent SE-EM is its slow enhancement rate, which makes it easier to control particle growth (silver nucleation). Figure 5 shows labeling of parvalbumin in a neuronal dendrite with gold/silver particles of about 25 µm. 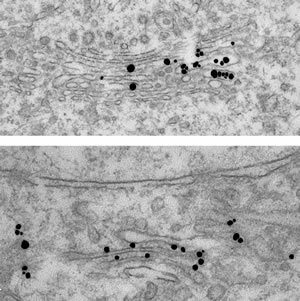 Arrows indicate cross sectioned microtubules with about the same diameter as the silver enhanced gold conjugate. Figure 6 demonstrates the labeling of MGP-130, another golgi marker protein. The gold/silver particles have a diameter of about 5 nm. Although ultra small gold conjugates and silver enhancement reagent have been used for pre-embeding single immunolabeling for many years, the co-localization of multiple antigens with the pre-embedding immunolabeling technique still relied on combining ultra small gold conjugates with conventional gold (5-30 nm) conjugates (Verkade et al. 1997) or enzyme conjugates (Pickel et al. 1986, Rouse et al. 2000). Bienz et al. (1986), using conventional gold reagents in postembedding, demonstrated that silver enhancement allowed the use of primary antibodies from the same species for double labeling. If multiple labeling were to be achieved using exclusively ultra small gold conjugates, silver enhancement would have to be applied in such a way that particles with different shape or size are produced. This might be possible through sequential immunogold labeling and silver enhancement. Thus, the first ultra small gold conjugates will be enhanced twice and will therefore generate a larger size than the second ultra small gold conjugate, which will be enhanced only once. To test the feasibility of the above approach, a series of experiments using mouse brain tissue were conducted. Primary antibodies, rabbit anti-glial fibrillary acidic protein (GFAP, Dako, Carpinteria, CA) and mouse anti-synaptophysin (Chemicon International, Temecular, CA) were chosen in the model system because of their known specific antigen localization in the central nervous system. The mutually exclusive distributions of their respective antigens also made them ideal for testing the specificity of the procedure and evaluating particle size segregation. 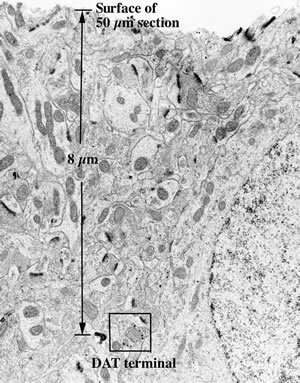 TEM examination of the labeling revealed two distinct size distributions (Figure 7). 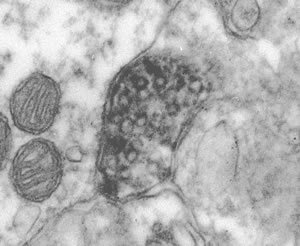 Small GFAP gold/silver particles were found associated primarily with filamentous structures in the perikarya and processes of glial cells. 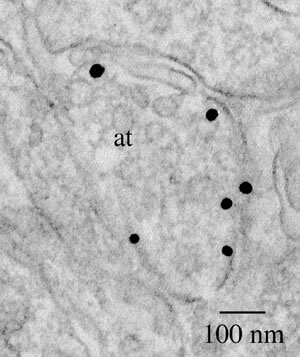 Large synaptophysin gold/silver particles were predominantly present in axon terminals associated with synaptic vesicles. Occasionally small particles were seen in axon terminals mixed in with the larger particles. In control samples, when one of the primary antibodies was omitted, there were no gold/silver particles of relevant size concentrated within the expected structures, except for a few randomly distributed background particles. 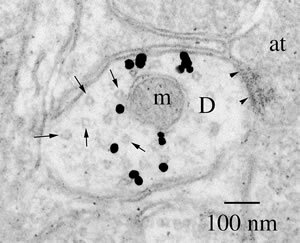 Quantitatively, particles within glial profiles showed a mean diameter of 11.2 +0.14 nm, and particles in axon terminals had a mean diameter of 36.3 +0.36 nm. 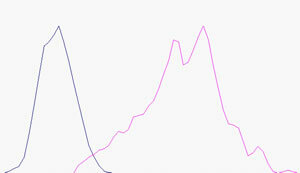 This difference was highly significant by a 2-tailed Student t-test (p<0.0001). The number of particles in axon terminals whose size overlapped with particles in glia represented 2.9% of all particles in axon terminals. The region in the frequency distribution curve (Figure 8) for particles in axon terminals that overlapped with particles in glia was separated by more than two standard deviations. When silver enhancement is depended on for creating the particle size segregation, the homogeneity of the enhancement is the most crucial. With any enhancement reagent, a certain degree of variability is expected. Considering this variability and the particle size suitability for our application, we sought a greater difference in size than is normally used in post-embedding double immunogold labeling with conventional gold conjugates. In theory, the larger the size difference is between the two groups of particles, the smaller the degree of overlap. However, as a practical matter, particles must be large enough to ensure adequate visualization, but not so large as to obscure the underlying ultrastructure. In the above described experiment, the enhancement duration required to obtain a final particle size of 10-12 nm was first determined through a series of single labeling experiments and applied to the second silver enhancement. The duration of the first silver enhancement was systematically varied to create particle size segregation. It should be pointed out that the particle sizes and the degree of segregation generated with the presented protocol are not fixed parameters. It is possible to generate combinations of smaller particles, which may be advantageous for co-localizing more contiguous antigens. Adequate preservation of ultrastructure is another major issue. In most immunogold/silver labeling protocols, silver enhancement is carried out after post-fixation with glutaraldehyde and before post-fixation with osmium tetroxide, at which point the ultrastructure is still vulnerable. Yet, many silver enhancement reagents require extensive water washes prior to and after the enhancement, which is the major cause of deterioration in the ultrastructure quality. In sequential pre-embedding double immunogold/silver labeling, preserving tissue ultrastructure is even more challenging since additional fixation with a high concentration of glutaraldehyde can not be applied before the first enhancement due to its possible effect on subsequent antibody-antigen recognition. In search of an alternative to the water washes, an Enhancement Conditioning Solution (ECS) developed by Aurion was used. The solution was applied before the silver enhancement to remove phosphate and chloride ions which could form insoluble precipitates with silver ions. Sodium thiosulphate was added to ECS and used after the silver enhancement to stop the enhancement process and eliminate residual silver ions. In turn the thiosulphate is removed through several washes with ECS. Compared to water, the application of ECS as washing solution greatly improved the morphological quality of our samples. 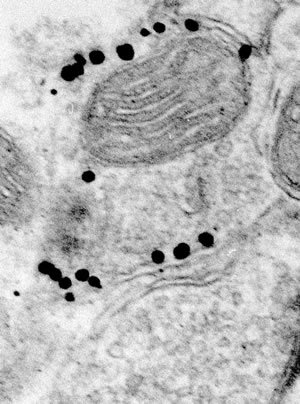 Membrane outline was fairly intact, and all major organelles were clearly recognizable. Ultra small gold conjugated F(ab’) and F(ab’)2 fragments of goat anti-rabbit IgG and goat anti-mouse IgG, acetylated bovine serum albumin (BSA-c ™), bovine serum albumin (BSA), cold water fish skin gelatin (CWFS gelatin) and R-Gent SE-EM electron microscopy grade silver enhancement reagent were from Aurion (Wageningen, The Netherlands). Enhancement Conditioning Solution (ECS) was developed by Aurion (available as a 100 ml 10x concentrated solution, product code 500.055). Adult C57B16 mice were anesthetized with chloral hydrate (400 mg/kg), and perfused transcardially with 150 ml of 3% freshly depolymerized paraformaldehyde and 0.15%glutaraldehyde in 0.1 M phosphate buffer (PB, pH 7.2 –7.4) at a rate of 10 ml/min. Brains were removed and further fixed in the same fixative for 1 hour at 4 °C, and sectioned coronally at 50 µm using a Vibratome. The sections were then collected and washed thoroughly with PB. Aldehyde inactivation: 0.1% sodium borohydride in PB, 15 min. PB, 4 X10 min. Permeabilization: 0.05% Triton X-100 in PB, 30 min., PB, 4 X 10 min. Blocking: Aurion Blocking Solution, 60 min. at 4 °C. Wash: PBS-0.2% BSA-c™, 2 X 10 min. Wash: PBS-0.2% BSA-c™, 6 X 10 min. Wash: PBS-0.2% BSA-c, 6 X 10 min. Wash: PB, 2 X 10 min. Post-fixation: 2.5% glutaraldehyde in PB for 2 hrs. Wash: Distilled water, 4 X 10 min. Silver enhancement: 2 sections per well (24-well plate) with 300 µl R-Gent SE-EM enhancement mixture for 60-90 min. Wash: Distilled water 4 X 10 min. Osmication: 0.5% OsO4 in PB, 15 min. Wash: PBS-0.2% BSA-c ™, 2 X 10 min. Pre-enhancement washing: ECS, 4 X 10 min. 1st silver enhancement: 2 sections per well (24-well plate) with 300 µl R-Gent SE-EM enhancement mixture for 90 min. Enhancement termination: 0.03 M sodium thiosulfate in ECS, 10 min. Wash: ECS, 4 X 10 min. 2nd secondary antibody incubation: Ultra small gold conjugate in PBS-0.2% BSA-c at 1:100, overnight at 4 °C. 2nd silver enhancement: 2 sections per well (24-well plate) with 300 µl R-Gent SE-EM enhancement mixture for 60 min. Distilled water 4 X 10 min. Osmication: 0.5% OsO4 in PB,15 min. Sections were dehydrated and flat embedded in Eponate 12 resin between two sheets of Aclar film. After resin polymerization, small pieces were dissected from flat-embedded sections, mounted on plastic stubs, and sectioned en face. Ultrathin sections were stained with 4%aqueous uranyl acetate and lead citrate.